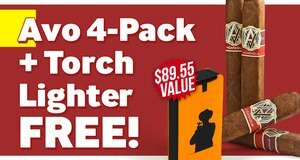 Avo 4-Pack + Torch Lighter Free With Purchase! Buy a box of Avo Syncro Ritmo, Avo Syncro Nicaragua Fogata, Avo Syncro Nicaragua, Avo Classic, Avo Domaine, and Avo XO cigars, get an Avo 4-Pack + torch lighter, valued at $89.55, absolutely FREE! Sign up for JRCigars.com emails and get updates about weekly specials, events, & more! * Offers valid while supplies last. JRCigars.com is not responsible for typographical errors. ©1997-2019 JRCigars.com, Inc. All Rights Reserved - 2589 Eric Lane, Burlington NC 27215. WARNING: JRCigars.com does not sell tobacco related products to anyone under the age of 21, nor do we sell cigarettes. Cigars and Tobacco products on this website are not intended to be purchased by anyone under the age of 21. All references to “mellow”, “medium”, “full” are only descriptors of flavor. No cigar should be considered to present a reduced risk of harm compared to other cigars. Get $5 offWHEN YOU SIGN UP FOR OUR EMAIL! Excellent ChoiceKeep an eye on your inbox for that coupon code. Your login link is invalid or already used. Please use another one! A shipping address is required. Please ensure you fill all the required fields before saving. It's been added to your cart so you can check out as normal. Sorry, you just missed out! Try again on the next Rapid Fire! You currently do not have access to this type of auction. If you would like further assistance, we're happy to help - please contact our Customer Service Department or call 888-JR-HELP-ME - (888-574-3576) voice, M-F 9am to 5pm EST.